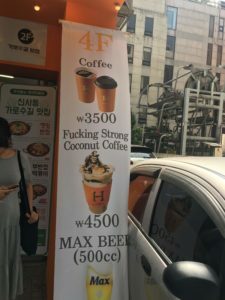 Back when I was living in Japan, I didn’t have much interest in visiting Korea. Not that I had anything against the country—I just preferred to visit places in Asia that were more distinct from Japan and I worried that the overlap between Japanese and Korean culture, architecture, and urban life would make for a not-so-interesting vacation. Plus, I always figured, “Hey, it’s less than a two-hour flight away—I can go anytime.” But anytime turned into no time, and before I knew it, I had left Japan without paying a visit to one of its closest neighbors. Then, a few years ago, something changed. 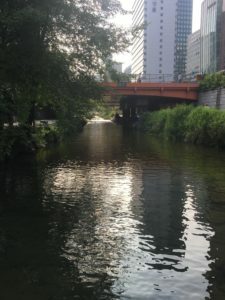 I started reading articles about how hip Seoul has become, how focused the city now is on art and design, and how many resources have been poured into making it over as a glitzy urban destination. My Japanese friends rave about going there for a weekend of shopping, eating, and beauty treatments. 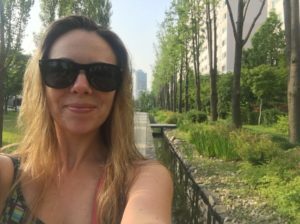 What really sold me, though, was reading about Cheong-gye-cheon, a stream that was once paved over with concrete and, thanks to a multi-million dollar renewal project, has been transformed into an urban park that runs through downtown Seoul. When I saw pictures of this beautiful place, I knew I had to go there someday. So I finally had the chance when I booked my most recent trip to Japan—flying on Korean Airlines, I was able to fly from SFO to KIX (Kansai International Airport) via Incheon, then from Haneda to Gimpo, and finally from Incheon back to San Francisco. For the record, I think it’s probably better to fly to Tokyo directly and THEN on to Seoul since Tokyo is closer to the US, which meant on the way there I extended my travel time by a few hours (and the difference between an 11-hour flight and a 13-hour flight, followed by a two-hour layover, followed by an hour and a half flight is substantial). But for the ease of getting everything on one ticket, it wasn’t too bad, and at the time I bought it, it was one of the cheapest fares I could find. So, enough background! 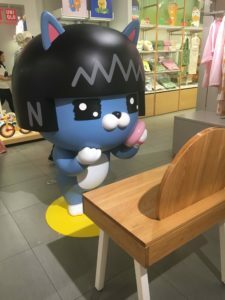 What did I actually DO in Seoul? Here’s a quick guide to some of the highlights. 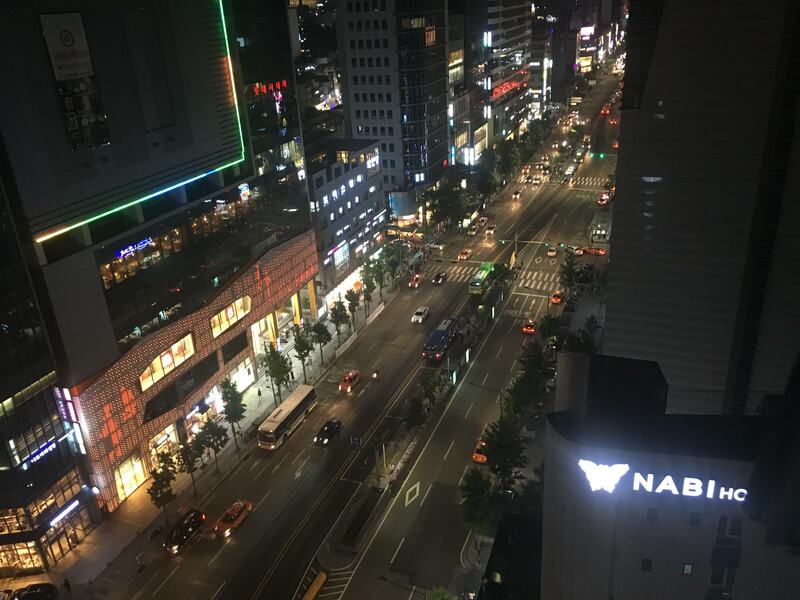 A friend of mine who spent many years living in Seoul advised me that Hongdae was the happening part of town and the center of the city’s youth culture, plus it’s super convenient since Hongik University station is on the AREX line, so you can travel directly to and from both airports without transferring. I was also very impressed that my Airbnb was located in the same building as the subway station. I literally just had to go out the exit and take the elevator up to my apartment. I had a great view of one of the main streets in the neighborhood and it was full of large shopping complexes and tucked in with small shops, cafés, and restaurants everywhere. I would often just wander around in the evening and pop into the stores. 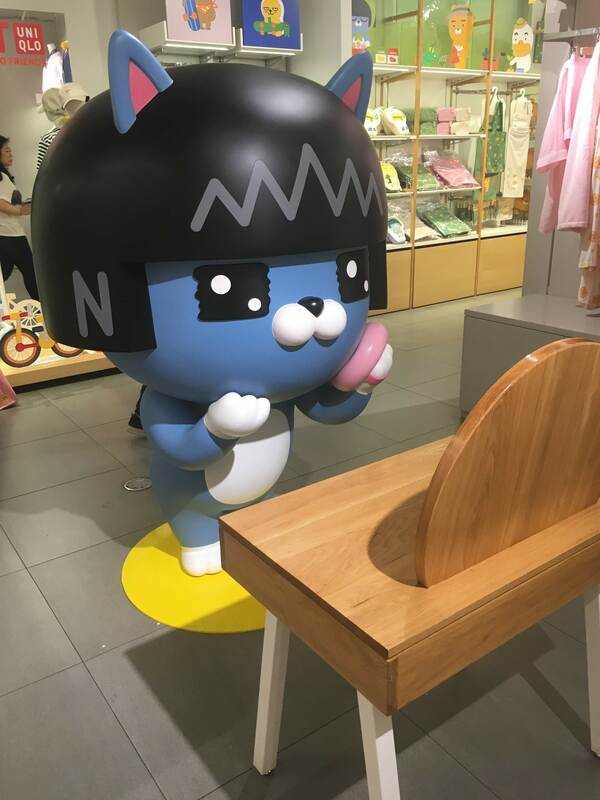 Some of my favorites were the numerous cosmetics stores with their mind-boggling array of sheet masks and the Kakao & Friends store where I discovered my new favorite character, Neo, who looks like a geisha cat. If you like to be surrounded by throngs of people and tons of shopping and dining options, Hongdae is an awesome place to stay. There was also a cute little park behind my building with a paved walkway, some little streams, and even more cafés and restaurants on either side. 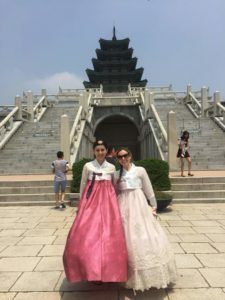 One of the activities I was most looking forward to was dressing up in a hanbok (traditional Korean dress) and spending some time sightseeing, especially because your admission fee is waived if you show up to a palace wearing a hanbok. 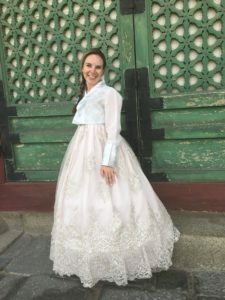 I did some research beforehand and found that there were a few places where you could rent hanbok, pick out accessories, and even get your hair styled. 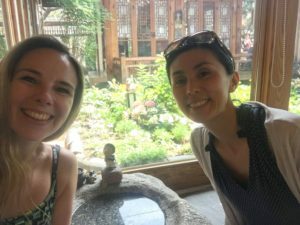 My friend who lives in Seoul had never done this before, so she agreed to join me. 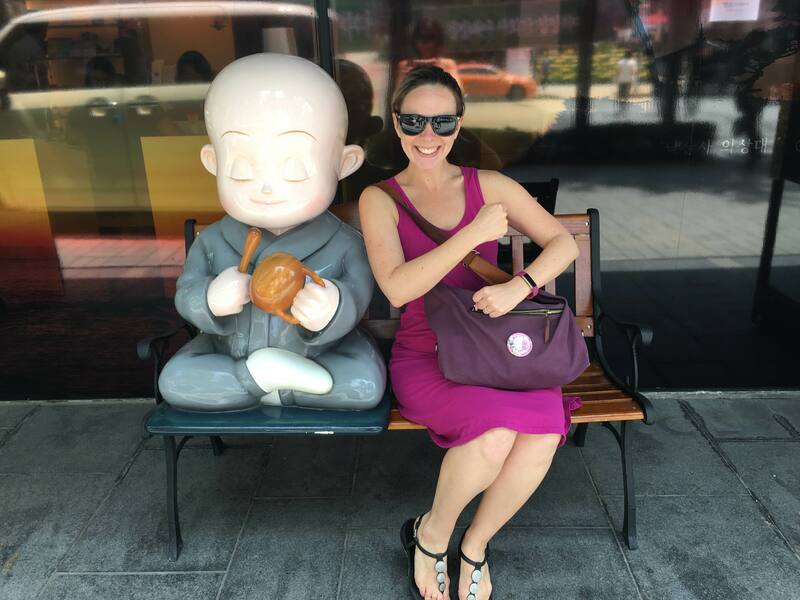 Unfortunately, it ended up being super hot during my visit (well, it was around 86º Fahrenheit—after living in the Bay Area for 7 years, I now find that super hot), which meant that it was really unpleasant to wear layers and layers of polyester and long sleeves. It was also a national holiday in Korea, so the shop was totally packed. In the end, we opted not to get our hair styled and just tried to choose our outfits and get out of the cramped and sweltering shop as quickly as possible. But despite the heat and the crowds, we enjoyed wandering around the palace and its surrounds. The layout of the palace was interesting—there was a lot of open space and courtyards, and some buildings you could walk around in. We were trying to find a teahouse but never managed to track it down. 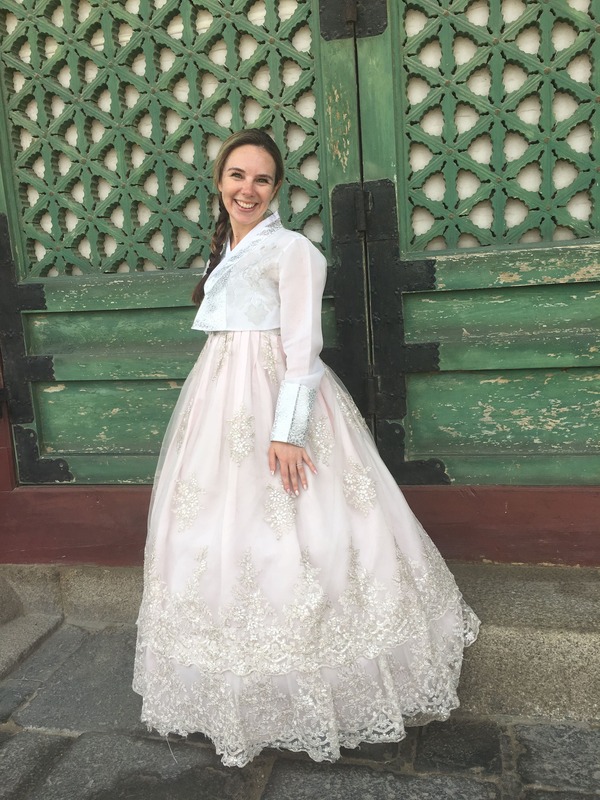 We also had a reservation to visit the Huwon (Secret Garden) at Changdeokgung in the afternoon, so we gave up after a while and skedaddled back to the hanbok rental store to return the dresses. The verdict? It’s fun to pretend you’re a Korean princess and dress the part, but I highly recommend doing it during a cooler time of year and maybe not on a national holiday so your experience can be a little less hot and frantic. Bukchon Hanok Village is a charming neighborhood full of traditional wooden houses that’s situated right between two of Seoul’s major palaces, Changdeokgung and Gyeongbokgung. It was fun to wander around the narrow alleys and admire the façades of the old houses. As we explored, we stumbled upon the most adorable little teahouse, Chateul. The courtyard bloomed with plants and flowers, and the large windows inside overlooked the mountains that surround Seoul. 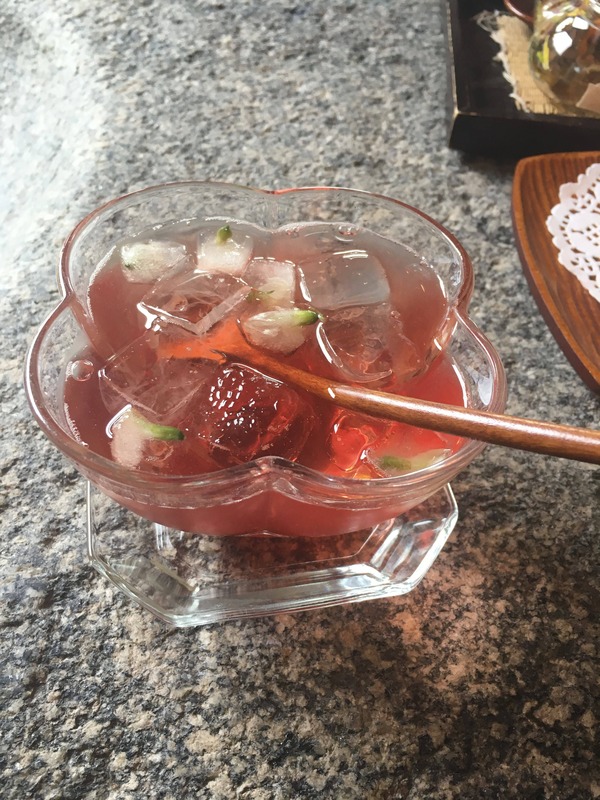 I ordered something I’d never heard of before, ice flower tea. It was a sweet, strawberry-flavored tea served with ice cubes that had flowers frozen into them. The flowers gently unfurled as the ice melted, like the gentle passing of winter to spring. Definitely one of the most delicate and beautiful beverages I’ve ever had! Not too far from the palaces and Bukchon Hanok Village is Insadong, one of the most traditional neighborhoods in Seoul. It’s full of teahouses, souvenir shops, and labyrinthine alleys that double back on themselves. 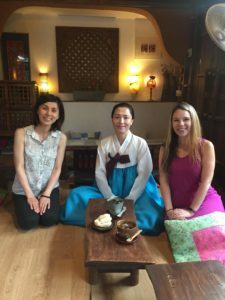 My friend is lucky to have befriended a Korean tea ceremony instructor, Kyunghee, who invited us to spend the morning with her in Insadong where she gave us a demonstration of tea ceremony in a 100-year-old tea house. Here she is pouring the tea. 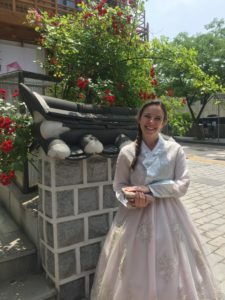 You can see that Kyunghee’s hanbok is much simpler than the one I had worn the day before (because, of course, I had to choose the princess version rather than the regular one!). After she gave the demonstration and explained to us about the different elements of the ceremony (including her clothing and accessories and the way she folded the towel to symbolize the days of the week and months of the year), we relaxed for a bit, taking in the sights and sounds of the teahouse. We were the only customers, so there was just the steady beat of the fan oscillating back and forth, the occasional chirp from a bird, and the padded feet of the teahouse waitress who brought us our drinks. I ordered iced plum tea, which was much sweeter than any tea I’ve had in Japan. It came with these little rice cookies, which were crispy on the outside and airy yet sticky on the inside. 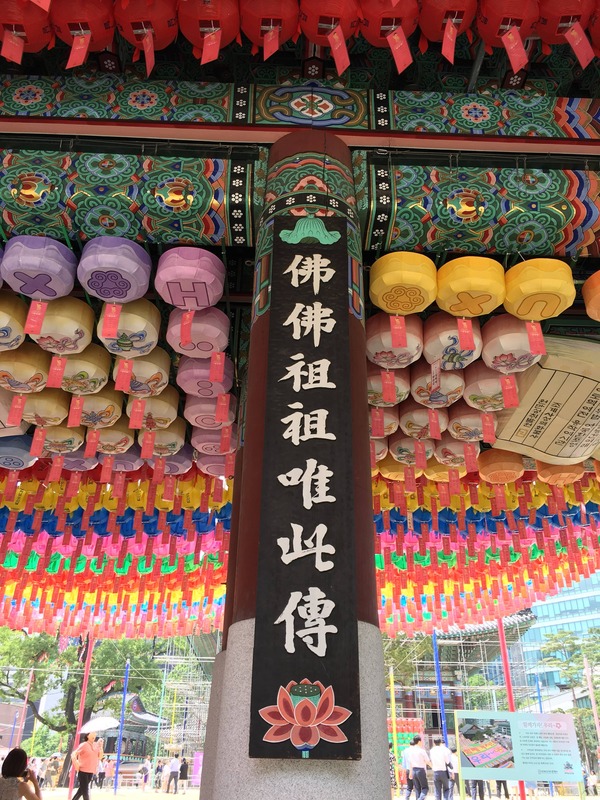 Next we went to the Temple Food Center where we learned all about Buddhist food—they had plastic samples of everything like what you can find outside restaurants in Japan, a kitchen classroom where you can take workshops, and information about the history of temple food in Korea. 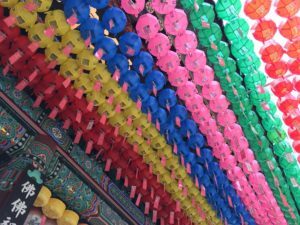 On another floor, they have a restaurant where you can actually sample the cuisine, but it was still a little early for lunch so next we headed to Jogye-sa temple to take in the colorful lanterns and décor. 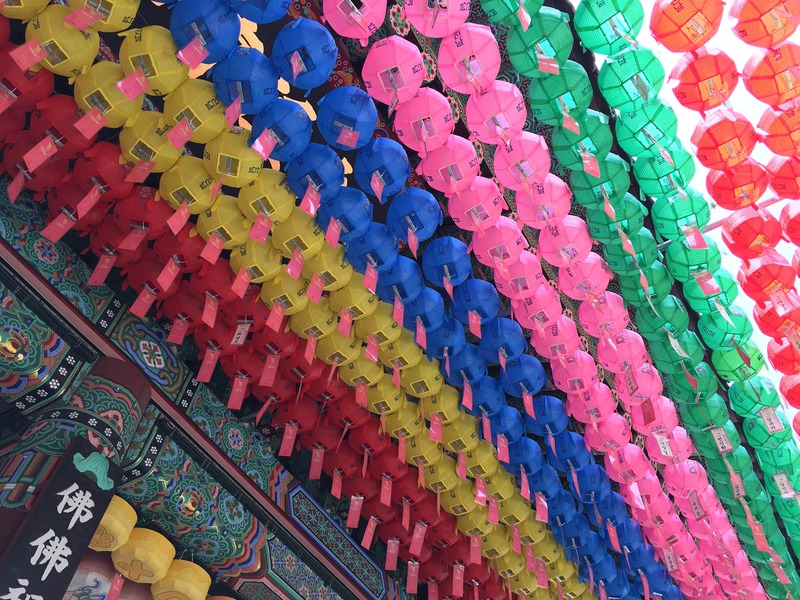 For lunch, I headed to Ose Gye Hyang, which was tucked into one of those tiny Insadong alleys. I don’t totally understand how I managed to find it, but Google Maps definitely came in handy! I opted for the soy meat barbecue with vegetables, which you can see also came with soup, multigrain rice, and lots of small side dishes. Not everything was to my taste, but it was nice to get to try so many different things in one meal. As I mentioned earlier, having the chance to walk along this stream was one of the main reasons I wanted to come to Seoul. And it didn’t disappoint. 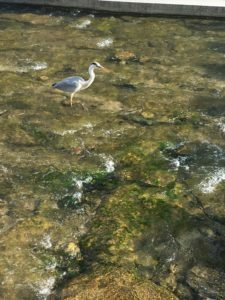 I wandered along the stream for an hour or so in the late afternoon (part of me wanted to walk along the whole 10 kilometers or so, but I started getting hungry at some point and wanted to make sure I had enough time to get some dinner). 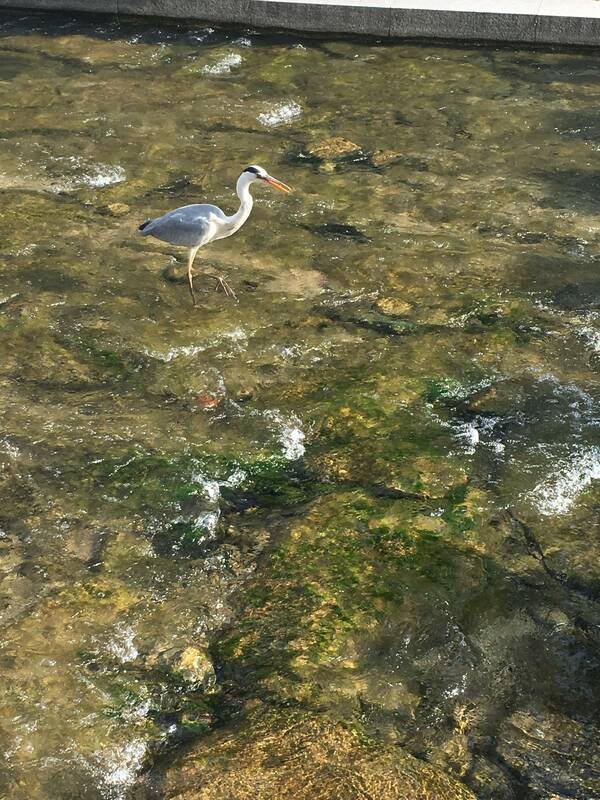 There were herons taking a dip in the water, sunlight rays streaming through the spaces between skyscrapers, and plenty of moments for quiet contemplation. 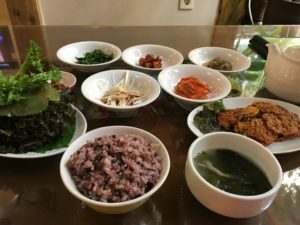 I know that Korean cuisine is known for being very meat-focused, and my understanding is that vegetarianism and veganism are not as prevalent in Korea as they are in other countries. That said, Korea has a strong tradition of Buddhist temple food that’s free from animal products, and I was able to find a handful of vegetarian and vegan restaurants to try during my visit. 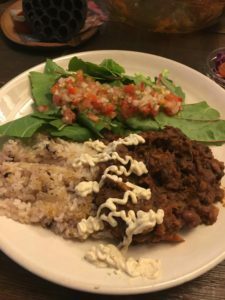 This blog post was extremely helpful as I was planning my veg itinerary. I mentioned Ose Gye Hyang earlier, but my favorite establishment was Plant Café in the foreign enclave of Itaewon. 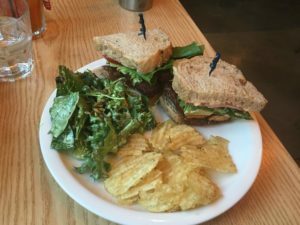 I got a tempeh lettuce tomato sandwich (not the most Korean dish, I know, but it was SO GOOD) and a chocolate Oreo brownie. 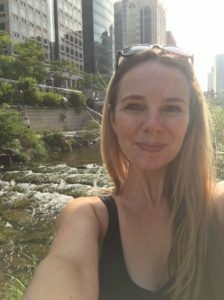 It was also fun to just wander around Itaewon–it’s jam-packed with restaurants, bars, and shops, and has a lively atmosphere. Another spot I really liked was Café Sukkara, a Japanese-style café in Hongdae (the fun, youthful area where I was staying). They had a couple of vegan dishes on the menu, including a soup, bread, and dip combo as well as a veggie taco rice (pictured below). Note: Korean taco rice was MUCH spicier than any of the ones I sampled on my veg tour of Kyoto. 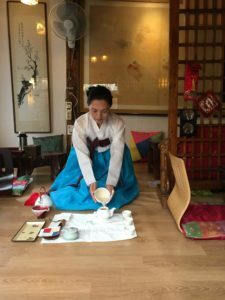 I can’t write about Seoul without mentioning the café scene there. It is INSANE. I have never seen so many coffee shops, stands, cafés, and convenience stores selling pre-made coffee beverages. But one thing that I found really surprising was that most coffee shops didn’t open until 10 or 11. That’s fine if you’re a student or a youngster who’s been out all night partying, but what about those of us who like to leave the house before 10am? I guess we just have to go to convenience stores and drink the pre-made stuff until the rest of the city wakes up. Or we can hold out until we find the good stuff, like what’s pictured below. 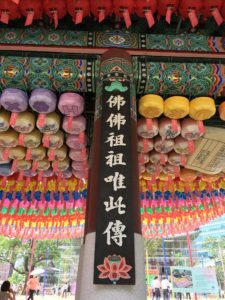 I enjoyed my visit to Seoul, though I did find it overwhelming at times to be surrounded by a language I don’t read or speak. It brought back some memories of my early days in Japan when everything was so new and mysterious. It takes a lot of mental energy to try to make sense of the world around you! And while there are indeed many similarities and overlaps between Seoul and Tokyo, it was still fun to spend a few days exploring a brand new (to me) corner of the world.